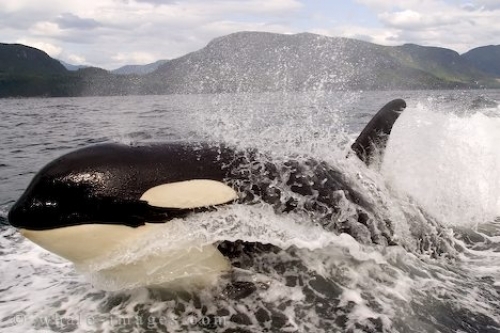 Surfing Killer Whale, beautiful sight of Wild Animals on a thrilling whale watching tour in British Columbia, Canada. These young wild animals do a fine job of keeping up with the boat while traveling at 20 knots. Even at this young age these wild animals exhibit a lot of energy and power when they surf behind a boat. This beautiful young killer whale is captured here on film with the foaming water trailing behind and is almost riding on top of the water, you can also see the tiny plume of fine mist as the whale exhales.